A state audit says the Department of Higher Education’s lack of oversight has contributed to $5 million in unpaid student loans. 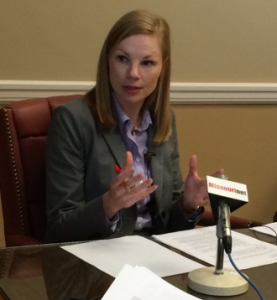 State Auditor Nicole Galloway, whose office conducted the audit, says the department did not correctly track or monitor records for its Advantage Missouri program, which allowed forgivable loans to students who agreed to work in high-demand Missouri jobs. “The Department of Higher Education did not implement rules so borrowers knew exactly what the terms of the loans were. They didn’t send proper notifications to borrowers. There was no delinquent notices sent,” says Galloway. Galloway says approximately 2,000 students received this type of loan. About 65% of them have outstanding loans. If the department plans to garnish wages of borrowers who owe loans, Galloway says that’s very concerning. “This could have downstream effects on the students who now all of a sudden are going to have to be expected to repay these loans. They have not received any communication from the Department of Higher Education for almost a decade and how that would affect their credit or their ability to repay these loans,” says Galloway. The audit also revealed the potential for unauthorized access to confidential student information maintained in a department database. The database is available for use by employees of institutions around Missouri. Although users sign a user agreement, the department lacks adequate procedures to ensure only authorized personnel access the system and to remove outdated user accounts when no longer needed. A statement from the Department of Higher Ed says no additional staff or resources were provided to manage the program when it was created. It says staff and funding cuts further restricted the department from tracking loan information. The department says it will continue to work with participants on repayment. The department says its electronic financial aid administration system is vital to its ability to effectively and efficiently award approximately $120 million dollars in state financial aid to more than 70,000 students in Missouri each year. It says there has been no breach of security since the system was established in 2005. The department says it recently revised the system to further strengthen the protection of sensitive information necessary to award state financial aid to students.